After looking at the impact drivers currently available, we brought in more than 30 models to find out who makes the best impact driver in multiple classes. There are some impressive new players entering the scene that look to challenge our traditional categories. When it was all said and done, the biggest names still stepped up to the plate. Before we ever started crunching the data from our test results, Tom Gaige called me up just to tell me how impressive Makita’s XDT16 is. It’s the most compact (by 1 mm) and the second lightest on our scales. At the same time, it held its speed and produced more measurable torque than impact drivers touting hundreds of inch-pounds more in their specs. Makita continues to blaze their own trail with its control system. 4 standard modes take care of the basics. From there, 2 Tech modes help with metal fastening, Assist mode gives you a slow start for wood fastening, and Auto-Stop mode loosens a bolt and stops so you can thread it off by hand. You can even program the button above the trigger to set your favorite mode or just let it run through the 4 standard ones. Milwaukee’s 2857 is a worthy choice if higher torque is your main goal. It out-torques Makita and offers a slightly better value. Milwaukee’s One-Key system lets you customize your controls using an app that also gives you tracking and management features. In our 12V testing, Milwaukee is at one level and everyone else playing on a different field. It blows the competition away in speed under load and measurable torque while offering the most complete feature set. One of the features that stands out on the Milwaukee 2553 is the self-tapping screw mode. It’s something we see in the 18V models, but it’s not so common in the 12V class. When you kick into it, you start the drive quickly and automatically back down in power to avoid shearing off screw heads in metal fastening. The oil pulse driver class is interesting thanks to the range of styles available between just 4 brands. Makita’s XST01 rises ahead of the competition by keeping its weight in check and maintaining its speed under load. And of course, it’s quieter than any standard 18V impact driver. Its only major hiccup is in value since it’s only available as a bare tool—something that won’t be an issue if you’re already on Makita’s 18V LXT battery platform. As a site with a Pro focus, Harbor Freight doesn’t often get serious looks from us. But their Hercules 20V Max Impact Driver has earned our attention. It sports a 4-pole motor and is just $99.99 with a single battery, charger, and case. It not only tops our DIY brands, but it also holds its own against other Pro 18V tools. Save for concerns about its 90-day warranty and some heat buildup, we’re impressed with the work it does. If you’re a fan of Pro Tool Reviews, you’ll notice that this is a different format for our shootouts. Rather than looking for the best impact driver in one class, we decided to make it more comprehensive. We took a hard look at the most current models available and really dialed in the testing to make it as objective as possible. In addition to this article, you’ll find breakouts for each class and individual reviews for every model. Click the links below to see the class-by-class results. No load speed is great, but maintaining speed under load is more important. To test this, we glue up layers of OSB subfloor. We use OSB because it delivers more consistent results than other lumber. Using 5/16-inch Milwaukee Shockwave nut drivers, we drive 3-5/8″ long, 1/4″ diameter ledger screws. These have threads roughly halfway down and we measure the maximum RPM with all of the threads engaged in the final inch of driving. The higher the RPMs, the faster the impact driver drives the fastener under a moderate load. If an impact driver can’t drive the ledger screw completely, we measure how much of the screw sits above the OSB after a 30-second drive. The value we report is the average of 5 tests with outliers in the data rejected and/or retested. We run two tests using a steel I-beam with Grade 8 hardened bolts, washers, and nuts. The bolts are welded to the I-beam, so they won’t move. We use Milwaukee Shockwave 1/2” square drive adapters and an impact-rated socket on the tool. 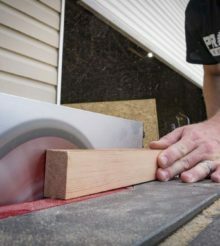 The first test starts by hand threading each nut down and using the impact driver to give it three 3-second bursts to tighten it as much as possible without overloading the motor. Some impact drivers have a soft start and the hydraulic impact drivers don’t hit as hard in general, so we also ran the test with a 5-second burst. It shows us which ones need longer to ramp up to a higher hard torque value and which ones hit hard out of the gate. The number we report is the higher of the two. To get a value, we use a Gearwrench 85079 digital torque wrench to measure how much torque it takes to loosen the nut back off. It is possible to get higher torque values with longer engagement. However, most applications that need more are better suited for stronger impact wrenches, so that’s where we draw the line. In the second test, we use our torque wrench to tighten each nut to a specific level. Then, we see if the impact driver can break it loose. Some impact drivers can break more than the torque wrench’s 250 ft-lb limit, so we use Gearwrench’s 64-832G torque multiplier to set the torque we need. We work up or down in 10 ft-lb (120 in-lb) increments until we find the maximum it can loosen. This test separates the impact drivers into 10 ft-lb nut-busting classes up to 250 ft-lbs. Once a driver exceeds 250 ft-lbs, the 6:1 torque multiplier changes the confidence in our accuracy. For models that need the torque multiplier, we move to 25 ft-lb increments. One thing to keep in mind is that the results represent the minimum torque each one can break and the actual value is between it and the next highest interval. Smarter people than us have tried to come up with standard torque testing for impact tools, but it proves to be a nearly impossible task because of how the impacting action works. Nut-busting torque is roughly 50% more than fastening torque. However, it’s not exactly the same in every tool, so there’s no formula we can use to tell you how much fastening torque each model actually has. It does let us differentiate between what each impact driver can fasten to and break away, however. There’s no magic in reverse torque. It simply takes less effort to loosen a nut than to fasten it to the same point. While an impact driver might fasten to 150 ft-lbs, it can loosen 225 with the same amount of actual torque. Our results don’t mirror that ratio perfectly, and other factors outside of our control affect our ability to try and confirm manufacturer specifications. However, our tests do allow us to repeatably and reliably differentiate between each impact driver. Even the best impact driver is a loud tool. The speed and frequency of the anvil striking against the hammer generate a lot of noise. Hydraulic impact drivers use an oil-based system with an elliptical mechanism to reduce the amount of noise greatly. They hit with less violence and engage the anvil longer than a standard impact driver. We use an SPL meter at 24″ (the average distance from tool to ear) to measure the A-weighted decibels that each impact driver produces. We ran tests inside and then outside in an open field with no difference in measured noise level. Moving into a small bathroom, there’s a significant increase in decibels. With those results in mind, we do our testing in the shop. Since impact drivers are designed to be powerful, but compact tools, the overall weight is an important factor. Keeping it lower helps reduce the amount of fatigue you have to deal with over the course of a workday. To keep the weights down, we asked each manufacturer to send a compact battery with their tool. In most cases, you can cycle two batteries between the tool and the charger without stopping to wait for a battery to finish charging. What complicates matters somewhat are the upgraded batteries on the market. The shift from 18650 cells to 20700 and 21700 means tools have more power and capacity available. There are also brands that go with a 6-cell system instead of the 5-cell systems that make up 18V/20V Max packs. We measure the bare weight of each tool and again with the most advanced compact battery available at the time of testing. The best impact driver models in each class will have a compact footprint. We measure the height and head length of each impact driver with a digital caliper to see which manufacturers focus on keeping the size down. The length is arguably more important than the height. Tools with a more compact head can squeeze into a smaller space. While we don’t come across many tools that have a terrible grip, some are better than others. Slide packs are important because they give design teams more freedom in handle and grip design. Stick packs have to fit into the handle and tend to be thicker than slide pack designs. Beyond the handle diameter, we also look at how the tool fits in your hand along with how comfortable and secure the rubber overmold is. In the real world, someone with small hands will like a different style that someone with large hands. While we look for significant issues that will affect everyone, the handle size does not play a part in the scoring. We also look for special features. Brushless motors require electronics that open the door to systems like Milwaukee’s One-Key, Bosch’s Connected control, and DeWalt’s Tool Connect. Some manufacturers like Makita choose to program helpful modes in rather than having you customize them. Of course, smart controls aren’t the only thing manufacturers add, and we look for anything out of the ordinary that’s genuinely beneficial. The value a tool offers will be different for everyone depending on what features, performance, and price you prioritize the most. Regardless, it’s the sum of what you get compared to the price you pay that determines the value for you. That’s how we give each impact driver a value rating. Impact drivers are the screwdriving champions of the world and have more fastening power and speed than drill drivers. In general, they’re lighter and more compact than drill drivers. Many Pros use them in tandem with a drill driver to drill a pilot hole and drive a fastener without switching bits. They also drive without transferring rotational torque to your wrist. This makes them ergonomically desirable for high-torque driving applications. At Pro Tool Reviews, we have our finger on the pulse of the tool industry. We’ve been in business since 2008 covering tools, writing reviews, and reporting on industry news in the commercial and residential construction industry. Each year, we bring in and review more than 250 individual products. Additionally, our team will put our hands on hundreds of other tools at media events and trade shows throughout the year. We consult with innovators in the technology and design of tools to gain a broader grasp of where these products fit and how they work. We also work with more than two dozen professional contractors around the United States and Canada who review products for us on their jobsites and consult on testing design, categories, and weighting. We’ll provide more than 500 pieces of new content this year absolutely free for our readers—including objective evaluations of individual tools and products. The end result is a testing design you can trust because of the editorial, scientific, and real-world professional experience we collectively utilize every time we pick up and test a tool. Would you be able to test the tightening torque by attaching the driver directly to a digital torque wrench that is secured to a table? Thank you for all of your effort and candor in rating and testing these tools as scientifically as possible in real world circumstances. I’m not one for commenting on these kinds of articles, but I wanted to say that the amount of work put into this set of reviews is greatly appreciated. I also felt the format of breaking things into more discrete categories really helps me as a consumer. Is the M18 Fuel with One Key a great impact? For sure, but 90% of the features it offers don’t serve my needs as a home gamer with the added cost, so it is nice to have some separation there. competition entries to a wider range of entries. One problem noted: the Hercules is not brushless. It does have a brushed motor. Otherwise, a great review. Thank you, sirs!